Universal pull-up bar MH-D002 is a total novelty of Marbo's Home Series. Due to special design of the MH-D002 it can be mounted both to the wall and to the ceiling. For the production of rod we use a strong profile 1.6"x1.6", which guarantees incredible durability of the product. The bar is powder coated with scratch and wear- resistant finish. All the nuts and bolts have special caps that increase safety and aesthetics of the product. The rubber handle has been designed specifically for this equipment. Ideally suited to the diameter of the bar, prevent slipping his hand during training. Imagine the following situation. You buy a bar attached to the wall, drill holes and it turns out that the material is made of your wall is too weak. With MH-D002 it will not be for you no problem! All you have to install 4 screws and mount the rod to the ceiling! 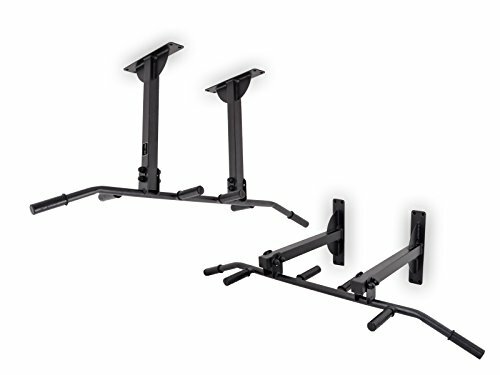 By using eight mounting holes the bar can be securely attached to both the wall or the ceiling. This guarantees supreme durability of mounting and solid stability of the unit in use. Please note that mounting screws are not included, since you need to select them according to your wall. Home Line Series products are designed for bodybuilding enthusiasts, who are starting to build their own gym. The equipment is thoughtful in a way that was possible at the same time functional and simple in the assembly. Home Line equipment is made of durable profile, guaranteeing stability incomparable with the competitorss within the same price range. Bright colors highlight the elegant aesthetics and clear lines of the unit. Distance: from the ceiling: 18.9" from the wall: 16.5" Width: 47" Weight: 12 lbs Profile: 1.6"x1.6"
Universal pull-up bar MH-D002 is a total novelty of Marbo's Home Series. Due to special design of the MH-D002 it can be mounted both to the wall and to the ceiling. For the production of rod we use a strong profile 1.6"x1.6", which guarantees incredible durability of the product. The bar is powder coated with scratch and wear-resistant finish. Marbo's Home Line Series products are designed for bodybuilding enthusiasts, who are starting to build their own gym. The equipment is thoughtful in a way that was possible at the same time functional and simple in the assembly. Home Line equipment is made of durable profile, guaranteeing stability incomparable with the competitorss within the same price range. Bright colors highlight the elegant aesthetics and clear lines of the unit. If you have any questions about this product by Marbo sport, contact us by completing and submitting the form below. If you are looking for a specif part number, please include it with your message.